The design and building of the Boeing 747 was an audacious leap forward in aviation. 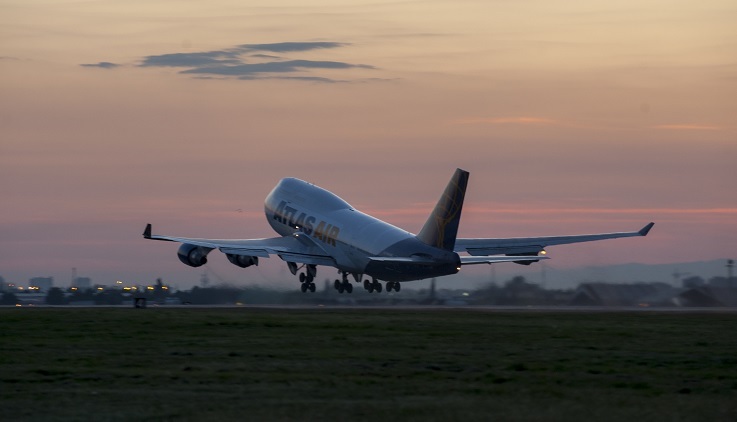 The demand to relieve congestion at airports struggling with the influx of a growing travelling public, was to be solved by offering fewer aircraft with higher carrying capacity. An aircraft with a carrying capacity double that of the existing work hosrses, the Boeing 707 and Douglas DC8, was required. Strangely enough, it wasn’t the extra carrying capacity that attracted early customers of the aircraft, but longer range compared to other aircraft of the day. The ability to consider designing such a large aircraft was made possible by the introduction of the High By-pass Turbo Fan engines that were able to deliver much higher thrust at a much reduced fuel burn rate compared to pure jets in use at the time. 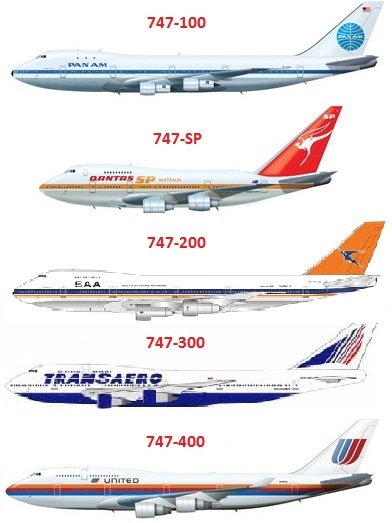 The Boeing 747 family of aircraft. The four engined Boeing 747 was designed to be the safest airliner so far built. Redundancy was in place for systems such as hydraulics, where a back up was available should the main system fail. There were dual control surfaces to enable the continued control of the aircraft should any of the surfaces fail. There were four main landing gear bogies each with four wheels. This was not only to spread the weight of the aircraft more evenly, but the 747 was capable of landing on two opposing bogies if necessary. Everything about the 747 compared to other aircraft in use at the time of its initial launch, was on a grand scale. For instance; 147,000 pounds (66,150 kg) of high-strength aluminium is used in its construction, 171 miles (274 km) of wiring along with 5 miles (8 km) of tubing is used, six million parts are used, half of which are fastners. Maximum Fuel Capacity 48,445 US Gal. 183,380 Litres 47,210 US Gal. 178,000 Litres 52,410 US Gal. 199,158 Litres 52,410 US Gal. 199,158 Litres 57,285 US Gal. 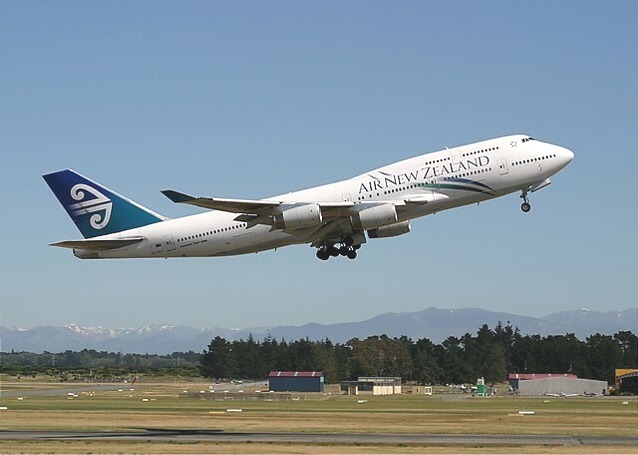 An Air New Zealand Boeing 747 400 takes off from Christchurch, New Zealand. 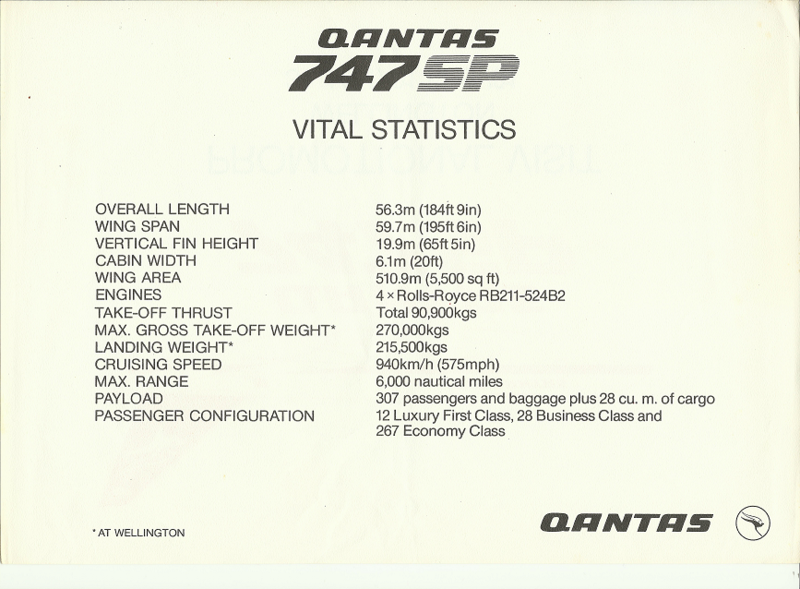 QANTAS was one of the airlines that ordered the 747 SP. 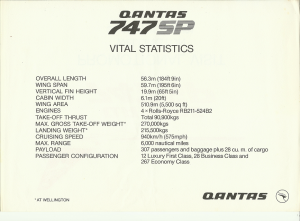 Due to its many long routes QANTAS benefited from the long range capabilities of the 747 SP without excess seat capacity. In January 1981 the SP was brought to Wellington New Zealand for a promotional and testing flight. Wellingtons’ runway is notoriously short and with water at both ends and fluky winds is a challenge at the best of times. The 747SP was the only 747 to ever have had scheduled services into Wellington. 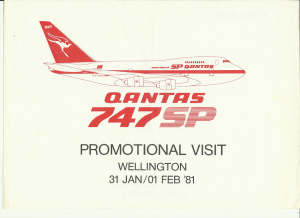 The arrival of the QANTAS 747 SP was quite an event. The hills surrounding the airfield were lined with spectators waiting for this giant of the skies to descend out of the cloud. It was a sight to behold at this little capital city airport. The only other 747 that had landed here was a Pan Am 747 100 which had to divert from Auckland and couldn’t make it to Christchurch. To get it off the ground again, they had to remove the seats and send them to Auckland on the train. Do you know where I can find info on the first groups of 747s delivered to TWA by Boeing. My Dad was a captain and I am curious if he flew the Flt 800 aircraft or not. I bet your Dad had some great stories to tell of those 747 days. I’ve scraped up some info below which I hope gives you some help to finding out more. Thank you for stopping by. Don’t forget to share out site.